The definitive work on succession law in Ireland. Succession Law in Ireland is a new book designed for legal practitioners which gives a practical insight into succession law. Succession law is branch of the law which provides the rules for the creation of succession rights to property by wills in the form of devises, legacies and bequests and the rules relating to the distribution of estates in cases of intestacy. A summary of the twenty-six chapters contained in Succession Law in Ireland will demonstrate the book’s comprehensiveness as well as its interconnection from chapter to chapter. 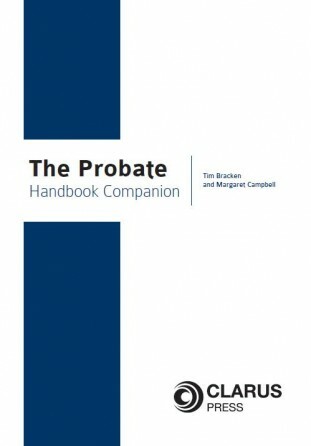 This book has also a body of useful precedents on wills, probate and Succession Act precedents. Chapters 1- 6 provide the rules for execution of wills, testamentary capacity, the revocation and revival, the creation of testamentary gifts and trusts, and are cross-referenced to Chapter 24 which provides wills precedents for testimonium and attestation clauses, revocation clauses, the appointment of executors and testamentary guardians, devises, legacies, bequests and testamentary trusts. Chapter 7 deals with intestate succession and the devolution and distribution of estates on intestacy. Chapters 8 – 9 deal with the legal rights of spouses and civil partners and applications by qualified cohabitants and applications by children under section 117 of the Succession Act 1965. 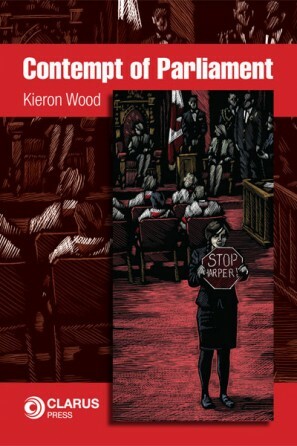 Chapters 8 – 9 interconnected with Chapter 26 which provides precedents for renunciations of the legal rights by spouses and civil partners, also for exercising the right of election and appropriation. Chapter 10 deals with the cessation of succession and legal rights by the criminal behaviour of spouses, civil partners and children of the deceased, the invalidation of wills and gifts and disclaimers. Chapters 5 – 7 deal with the creation of certain property rights in the form of donationes mortis causa, joint bank accounts and advancements, and also equitable property rights which come into being by the equitable doctrines of proprietary estoppel and constructive trusts, and these property rights have to potential impinge on succession rights created by wills or arising out of intestacies. Chapters 13 – 18 deal with applications for grants of probate, letters of administration with will annexed, letters of administration intestate, and applications for grants by guardians, committees and attorneys and also applications for de bonis non grants and caveats and citations. 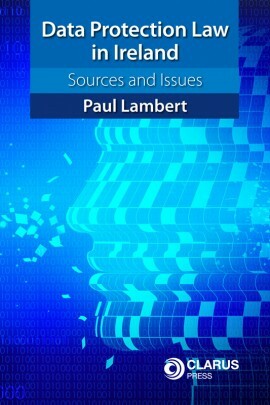 Chapters 13 – 18 are interconnected with Chapter 25 which provides precedents for applications for grants. Chapter 19 deals with the administration and distribution of estates by personal representatives, the duties and powers of personal representatives and their liabilities. Chapters 20 – 23 deal with probate motions, s.27(4) applications, probate and administrative actions and the important issue of costs, the construction of wills in construction suits, and the limitation of actions and the striking out of proceedings. Chapters 24 – 26, the final chapters in the book, provide wills precedents, probate precedents and Succession Act precedents and these chapters interconnect with various chapters in the book. Dr Albert Keating BCL, LLB, LLM, BL, DLitt, is a barrister and Senior Lecturer in Law at Waterford Institute of Technology. His published works on probate and succession law include Keating on Probate (2011) (4th ed) and Keating on Probate, First Supplement to the 4th ed (2013). 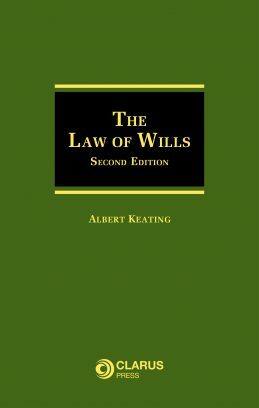 His books also include Probate Law and Practice, Probate Law and Practice Case Book, Probate Causes and Related Matters, Keating on Probate (2nd ed) The Law of Wills, Equitable Succession Rights, The Construction of Wills, The Law and Practice of Personal Representatives, Keating on Probate (3rd ed), Irish Wills Precedents, Irish Probate Precedents and Keating on Probate – The Complete Words, CD-Rom, (2004). His works on jurisprudence include Jurisprudence published in 2011 and numerous articles on the subject in the Irish Law Times. His most recent book on jurisprudence is Jurisprudence (2nd ed) (2014). 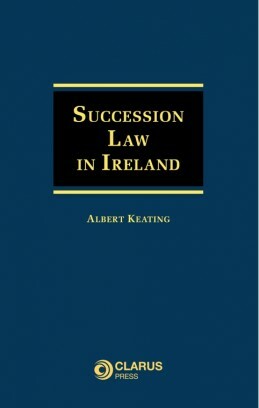 He has also published numerous articles on probate and succession law in such journals as the Conveyancing and Property Law Journal, Irish Law Times, Irish Probate Law Journal and Judicial Studies Institute Journal, and chapters on Probate and Succession Law in the Annual Review of Irish Law since 2004. Knowledge of succession law should be part of the arsenal of every legal practitioner that specializes or advise clients on succession and probate matters. 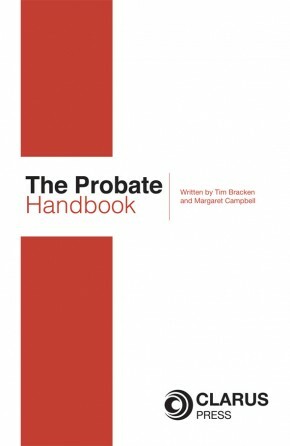 This book will equip the legal practitioner with all the tools and knowhow required including a bank of precedents on wills, probate and Succession Act precedents.